Justin Pace of Daniel Hand hits a backhand to Brett Gloria of Amity Regional in the SCC Boys/Girls Tennis Championship at Yale University in New Haven on May 23, 2018. NEW HAVEN — The Hand boys tennis team went undefeated during the 2017 season, then was upset in the SCC tournament final by Fairfield Prep. Top seed Hand defeated No. 2 Amity 7-0 in the SCC tournament final at Yale University on Wednesday afternoon, one day after Hand avenged the loss to Prep by sweeping the Jesuits in the semifinals, also at Yale. So the Tigers move to 20-0 with the Class L state tournament on the horizon. The Hand girls stand at 20-0 too after beating Amity 5-2 in the SCC final. This is the second straight title for the Tigers and the second straight undefeated regular season. Palmer noted that No. 2 and 3 singles players Lindsay Riordan and Annie Barrett, along with the No. 1 doubles tandem of Anna Lang and Lee Jiaen, haven’t lost this season. Amity girls coach Harold Freedman mixed up his lineup to try and pull off the upset. The Spartans (12-7) were able to take the No. 2 and 3 doubles matches — the only team this season to win two points off Hand. Hand finished 2017 by beating Guilford in the Class M state final. Now the Tigers will try to win Class L.
The Amity boys were swept by Hand in both regular-season matchups — its only two losses going into Wednesday. The Spartans were able to edge Guilford in Tuesday’s semifinals. Amity coach Chris Raffone also mixed up his lineup looking to find some magic. Top singles player Marco Delsanto playing at No. 1 doubles was among the moves. That move by Raffone pushed freshman Brett Gloria up to No. 1 singles, where he lost in straight sets to Pace. Another freshman, Hand’s Josh Israel, didn’t drop a single game against Zach Brocklehurst. Hand’s No. 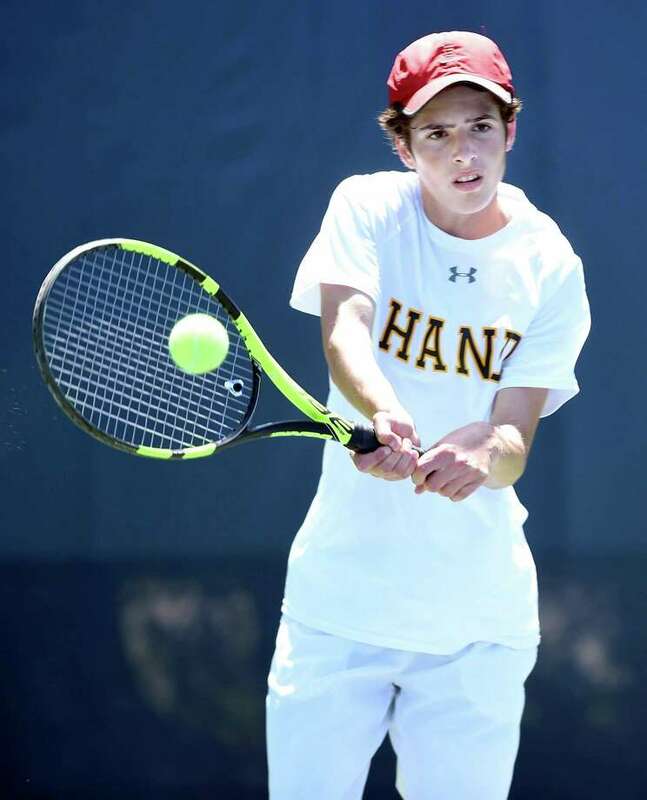 3 singles player, Noah Gulla, was the SCC’s Most Outstanding Performer in the boys tournament while Hand’s Sam Riordan took home the girls’ honors. Singles: Justin Pace (DH) Def. Brett Gloria 6-1, 6-2; Josh Israel (DH) Def. Zach Brocklehurst 6-0, 6-0; Noah Gulla (DH) Def. Ben Schiff 6-0, 6-1; Max Thompson (DH) Def. Arthur Lihar 6-2, 6-4; Doubles: Robbie Israel/Reilly Vejar (DH) def. Marco Delsanto-Henry Molot 5-7, 6-2, 1-0, retired; Alex Bueno/Darby Rogers (DH) Def. Chris Bullers-Andrew Johnson 7-5, 7-5; Nick Chieppo/Jamie Watkins (DH) Def. Ira Einbinder-Vince Li 6-1, 6-2. Records: H 20-0; A 17-3. Singles: #1 Sam Riordan (H) def. Sarah Bullers 6-3, 6-3; #2 Lindsay Riordan (H) def. Anisha Jain 6-0, 6-0; #3 Annie Barrett (H) def. Easha Acharya 6-1, 6-0; #4 Ellie Weinstein (H) def. Rhea Dey 6-1, 6-1; Doubles: #1 Anna Lang, Lee Jiaen (H) def. Sydney Pitter, Annika Minotti 6-1, 6-2; #2 Hannah Hipona, Catalina Betancur (A) def. Nicki Goldfeder, Nell Karas 6-2, 6-7 (4), 10-2; #3 Chloe Gherlone, Gabby McGovern (A) def. Jennie Burris, Clare Nelson 3-6, 6-3, 6-2. Records: H 20-0; A 12-7.